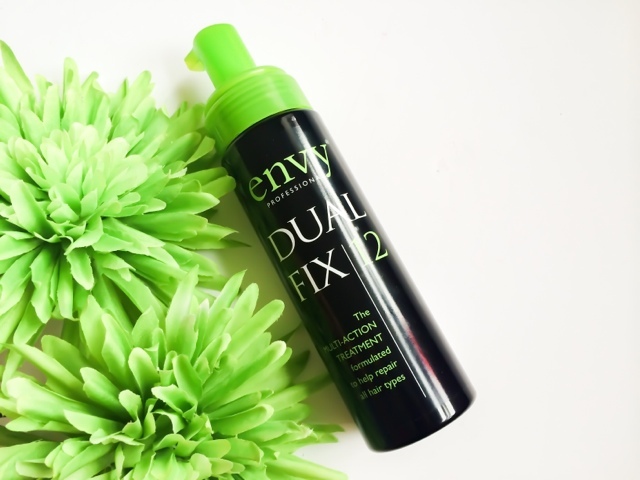 Lou Loves Beauty: Envy Dual Fix 12 | A Hair Hero? Envy Dual Fix 12 | A Hair Hero? Envy Dual Fix 12 is a professional treatment for all hair types said to restore damaged hair, adding thickness and reviving the colour. The brand itself was designed by a hairdresser who one day found out one of he's best selling treatments was to be discontinued. As a hairdresser myself I know exactly how this feels. But rather than sourcing he's products from somewhere else to find a replacement he decided to create he's own line of product that he as a hairdresser would use. And also products that deliver results that the clients can continue to use at home. So Envy was born. Envy Dual Fix 12 is said to.. The mousse treatment can be used in two ways. The first as an intensive treatment where the product is applied firstly to dry unwashed hair and then dried in with a hair dryer. Once dry you then wash and condition as normal ( they recommend two shampoos). The results of this are that of an intense conditioning treatment that leaves the hair feeling soft, smooth and manageable. I was impressed at how well it performed after just one use, as a dry haired gal my hair never really feels in tip top condition but this gave it life and shine that wasn't there before. Each hair strand felt nourished and made the tedious task of combing a pleasant painless experience and also left the fresh, fruity grapefruit scent in my hair even after rinsing. After the initial intense treatment you can use it weekly to maintain and further repair the hair. The weekly process is a lot easier. You apply it in between the shampoo and condition stage and leave it for just a minute before rinsing. This process sees the same results along the path as the intense version. My hair felt silky soft, conditioned and in a nut shell, a hell of a lot better than it was before! Have you tried Envy Dual Fix 12 before? Have you entered my Jo Malone Christmas GIVEAWAY yet? This definetly sounds like something my hair needs at the minute!